Fetch compliments for your sense of dressing by wearing this kurta presented by the coveted brand, Sanaa. It features a solid pattern that is complemented by a print detailing along the hem. In addition, it has been crafted from a premium quality fabric that will keep you at ease all day long. 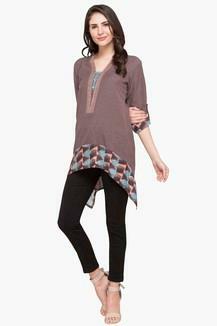 Featuring a solid pattern, this kurta will be an ideal choice for casual occasions. Team it with a pair of churidar pants and wedge sandals to make a fashion statement.